We all want our children to learn about gratitude. From an early age, we teach them to say “thank you,” well before they ever understand the concept and we help them send thank you cards for gifts received. Gratitude is about more than words and actions, and it doesn’t come easily for young children. In fact, if they aren’t helped and encouraged to do so, they may not ever fully grasp it. But if we take the time to help our children learn about and practice gratitude, it can have many benefits far beyond just being polite. It can even help reduce their anxieties. Several years ago I began writing down gratitudes to get my mind off of the repetitive anxious loop it was running. No gratitude was too small or off limits. Originally I did it just because I felt the need to find the good in my days, whether I felt it or not. 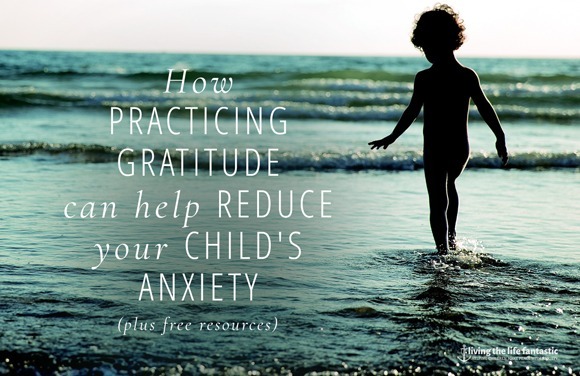 It wasn’t until I was learning how to help my children with their own anxieties that I began to have a real understanding of how beneficial practicing gratitude is for managing anxiety. Gratitude is not about being overly optimistic, naive, and ignoring suffering. Nor is it the same as being polite and using your manners and saying the words “thank you.” Those may be used to express gratitude, but they are not gratitude themselves. Rather, gratitude is about acknowledging and expressing appreciation for something; a state of mind that “doesn’t actually depend on your life circumstances.” And like mindfulness, it focuses on the known present moment, not the unknown. It’s a learned attitude and, as anyone with children has witnessed, it is not something that comes naturally to them. Heck – even adults have a difficult time being and feeling grateful. When anxiety fills the brain, it can leave little room for anything else and become what our mind focuses on. Gratitude is super easy to overlook when stressed or anxious because in those moments we tend to focus on the right now. 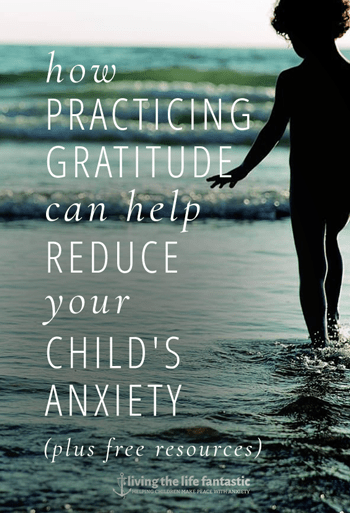 If a child hasn’t fully grasped the concept of gratitude, or recognized its importance beyond good manners, and learned to connect it with feelings of reduced anxiety, it will not be something that they naturally do when they are feeling anxious. Below are some ideas for helping your child learn about gratitude and how to make it a tool for your child’s anxiety-management toolbox. As with so many things in our children’s lives, learning to practice gratitude starts with us. If we spend our time complaining, never saying thank you, or acknowledging the good things in our lives, our children see that. What they see, they mimic. Spend some time thinking about your gratitude habits and see where you might need to make some improvements. Take note of your own gratitudes for at least a week. Don’t just think them; write them down and keep track of them daily. Commit to thanking your children and others. Let them know you appreciate them and when you are grateful for something they’ve done, and how they make your day brighter. Set the example for your children by letting them see you thanking others, and hearing you note what you are grateful for, whether it’s a beautiful sunset, a favorite sweater, a good meal, or a smile from the clerk at the store. Be sure to offer gratitudes for a variety of reasons, not just for material things, but relationships, abstract things etc. A gratitude jar is a good way for the entire household to participate. Get a jar with a mouth wide enough to reach your hand into and let your child decorate it. Cut out small strips of paper and leave them by the jar. Each time someone in the family feels grateful for something, no matter what it is, they can write it on the slip and place it in the jar. Try to write specific actions, behaviors, words etc, and not just general statements. If your child is too young to write, they can draw a picture instead. At the end of the week or month, read the gratitudes together. >> Download a free printable gratitude label for your jar. When I kept a journal while growing up, I mostly wrote in it when something painful had happened or when I had something angsty to write about. I never considered focusing on the things I was grateful for. If I had created a practice of doing this, it might have had a big impact on my attitude and outlook on things during rough times. To help your child get started with a gratitude journal, let your child pick out a journal (or use the free downloadable template below.) Once you have the journal set up, talk with your child about gratitude. If you haven’t already discussed the concept together, it might be helpful to read about gratitude together, especially for younger children. 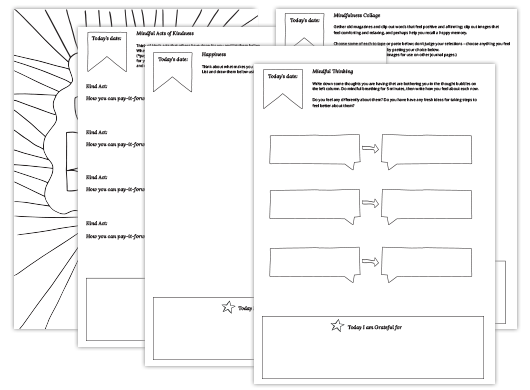 >> Download a free printable gratitude journal page template to get you started. Writing thank you notes for gifts is a good place to start, but it’s also nice to learn to express gratitude for day-to-day appreciations, whether it’s thanking the local librarian for helping find books, a teacher that helped make a new concept make sense, or a neighbor who always says hello and brightens your day. Thank you notes don’t have to be fancy or long. Let your kids make their own. If they are too young to write, let them draw a picture and have them dictate to you what they want to say while you write it out for them. A good rule of thumb is one sentence per age of the child. Practicing gratitude is not a magic potion that you take and your anxiety is gone forever. It is something that we must continue to practice. Just like anything else, the more we practice, the more our muscle memory grows. And also just like anything else, we are going to have times where we slip back into old habits, and that’s ok too – we all get grumpy, we all have bad days. So help your child understand that this is all part of a process and something you can practice together.